NIS antibody LS-C16858 is an unconjugated mouse monoclonal antibody to human NIS (SLC5A5). Validated for IHC and WB. SLC5A5 / NIS antibody was raised against synthetic peptide corresponding to aa37-54 of human NIS. Recognizes human Sodium/Iodide Symporter (NIS). Recognizes a major band at ~97kD and minor bands at 15kD, 30kD, 68kD and 160kD. Suitable for use in Western Blot and Immunohistochemistry. 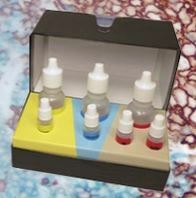 Immunohistochemistry: Use on paraffin embedded tissue sections which have been subjected to antigen retrieval with 10 mM citrate buffer steam for 30 minutes.